Text messaging is a convenient way to reach your clients and employees lightning fast. As soon as you hit send, they will have your message in their pockets or purses almost instantly. SMS boasts high open rates and is considered more effective than email. Your clients and employees might not check their mailbox frequently, but SMS messages are difficult to miss. 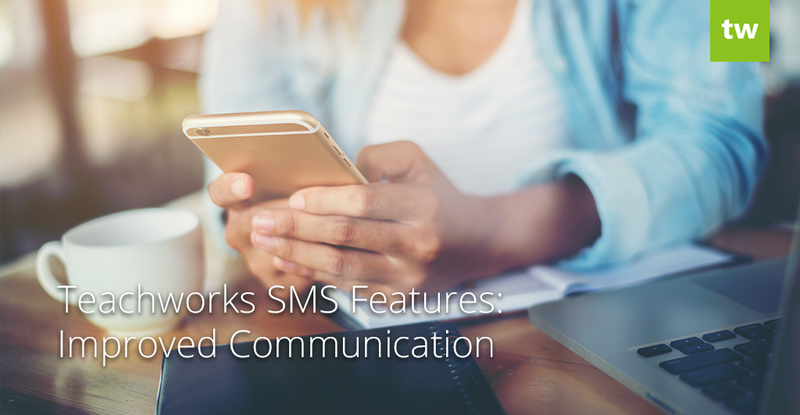 Teachworks offers two SMS add-ons that will allow you to easily reach your clients and employees anytime, anywhere. This recently added feature allows you to welcome your clients and employees to your business through SMS. The feature offers three customizable templates – one for clients, one for independent students and one for families. You can include merge tags to further personalize the message and you have up to 160 characters to provide key information to your clients. A character counter is included to help you craft the perfect message. To send a welcome SMS to a client or employee, you’ll need to select the option directly on their profile. After a welcome SMS has been sent, a date and time stamp will appear on the user’s profile. We all receive numerous commercial emails every single day and because of this emails easily get lost in the crowd. With our SMS Lesson Reminders add-on you can send lesson reminders to your clients and employees through SMS. The add-on comes with three customizable templates (for families, students and employees) and you can set a separate lead time for each type of recipient. 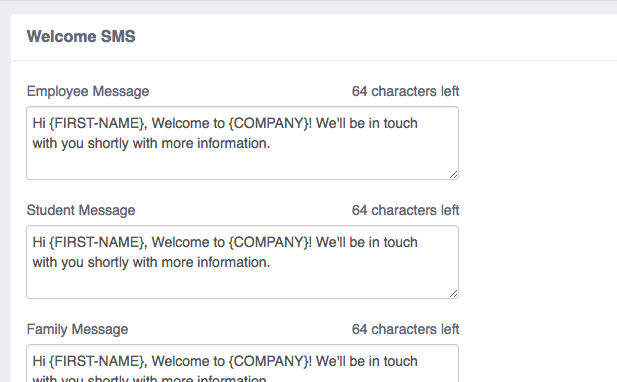 There are also a number of merge tags that you can use to personalize your message. To send SMS reminders to your clients and employees, the option needs to be selected directly on their profiles. 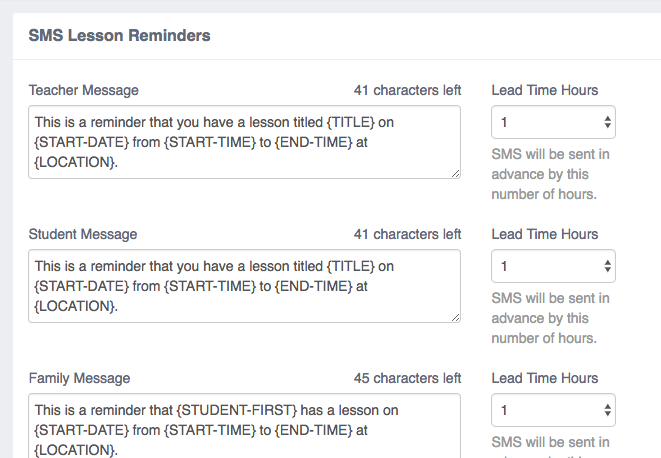 The SMS Lesson Reminders Add-on and/or the SMS Welcome Add-on need to be activated. A valid mobile number has to be added to each user’s profile. The option to send SMS reminders or a welcome SMS has to be selected on the user’s profile. You need to purchase SMS credit. In order to send SMS messages through one of our SMS features, you will need to purchase credits beforehand. To purchase credits, click the “Buy Credits” link under the “SMS Lesson Reminders” section on the Integrations & Add-ons page. SMS prices depend on the country of the recipient. To see the cost per SMS by country, you can select the relevant country from the “View SMS Rates by Country” menu. When entering mobile numbers on client and employee profiles, you’ll need to use the E.164 format. This format begins with the “+” symbol followed by the country code. If your client is from the UK for example, their number would begin with “+44”, followed by the subscriber number. In many countries, it’s necessary to add a 0 in front of the subscriber number for local dialling, but with the E.164 format, this has to be removed. US numbers are automatically converted to the correct format, provided that the number on the customer’s profile has 10 digits. If you’re still unsure about the number format, you can check a specific phone number’s validity here: https://www.twilio.com/lookup. The SMS Records table shows detailed information about each text message. You can see when the SMS was sent, who it was sent to, the delivery status, the cost of the SMS and more.